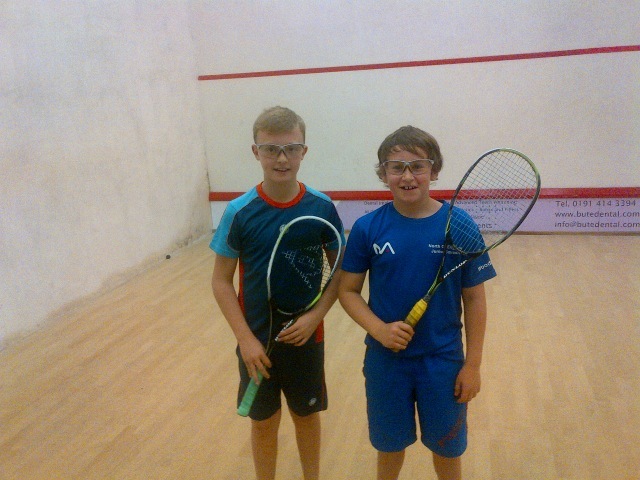 IRREPRESSIBLE squash scamp Michael Mattimore wreaked more havoc at the Northumbria Junior Open, seeing off all southern invaders to claim top prize in the BU15s. 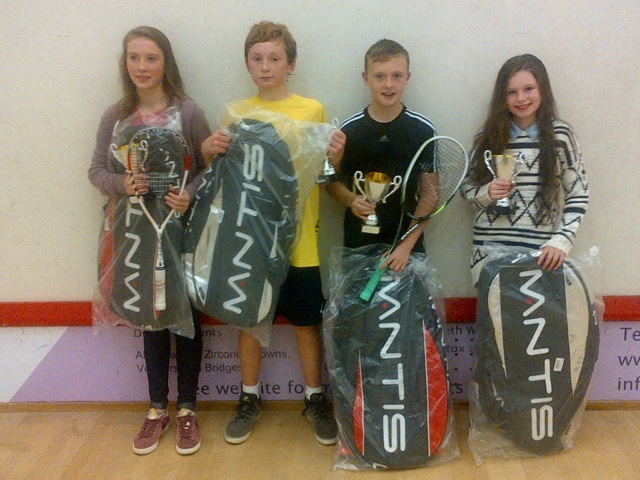 In a silver event – sponsored by Mantis – which attracted the cream of young squash talent from the Midlands up (and a select few from even further afield – such as India! ), this was a strong event, jointly hosted by Tynemouth and Northumberland club (thanks Ray ‘n’ Dave!) – and all credit to Northern prodigy Mattimore for some consistent, fast-paced squash. Jesmond’s Mad Max Forster almost matched that achievement – reaching the final of a buzzing Boys U13 section, while SEVEN more young Northumbrians did well to achieve top 5 finishes over the weekend: Erin Vitty and Lucy Anderson (G13), Josie Barker (GU15), Georgia Webster (GU17), Maria Bainbridge (GU19), Jamie Todd (Boys U17) and Cai Younger (BU19). But it was former England international Mattimore who led the charge – the 3/4 seed defeated Richard Hall (3-0), Elliott Ridge (3-1), Daniel Harrison (3-1) before overcoming Yorkshire livewire Yusef Forster 3-1 in a close final (11-9, 9-11, 11-7, 11-9). Jesmond’s Joe Wareing won the plate – having lost his first match to Joe Twigge, he beat Kean Appleton, David Collins and Daniel Wells to finish with a flourish. The Boys U13 event is afroth with irritatingly quick players in this region at the moment – and they produced some typically frantic struggles in a 24-strong tournament. Ferocious Forster (M) was the pick of the bunch. The No 2 seed beat Matthew Harrison, Tynemouth’s Lewis Follin and Simon Herbert, without dropping a game. However, No 1 seed Sam Todd from Pontefract lay in wait in the final – the Yorkshire lad proving too mean with a 3-0 win (11-7, 11-7, 11-4). Lewis Follin, and Northern duo Andrew Shipley and Tom Cornell finished 6th, 7th and 8th respectively. In the Girls U13 event, Northern’s Erin Vitty beat clubmate Lucy Anderson 3-1 in a super quarter-final to reach the last four, before going down to Lydia Robinson (3-1) and Jordan Corlett (3-0). Lucy went on to beat Megan Evans and Opelia Watson to finish fifth. Never-say-die Josie Barker proved top dog-ette in the U15 event; the speedy Northern starlet beat Aisha Forster in the first round, lost to another Yorkshire player, Ellen Cooper, in Round 2, then clinched a humdinger against Tynemouth’s Laura Neil (3-1), before beating Emma Campion for a well-deserved top 5 finish. Laura rounded off with a strong 3-0 win over Poppie Jaram in her last match to finish 7th, while terrific twins Emma and Amy Rowell of Primrose finished 11th and 13th respectively, and Jesmond’s Martha Spalding was 12th. Yorkshire also dominated the Girls U17 section, but Georgia Webster of Northumberland Club clocked up a couple of wins (Charlotte Fish and Leanne Herbert) to finish 5th, while Northern’s Tegan Younger beat Herbert 3-1 to clinch 7th spot. Maria Bainbridge was up to her old tricks at U19 level – beating Jesmond clubmate Charlotte Cooper 3-0 in the first round, before being outgunned in a close 3-0 defeat to eventual winner Jessica Davis in the semi-finals. Maria was so close to clinching third spot in a superb 3/4 play-off against Jessica Winder, but was ultimately edged out 3-2. Charlotte Cooper won her final match against Northern’s Caitlin Vitty to seal 7th place. Boys U17s is always a hotly-contest competition anywhere in the North of England – and the Northumbria Junior Open proved no exception. 3/4 Seed Chris Wiggins uncharacteristically came a cropper in round one to Lancashire’s fast-improving Isaac Rawcliffe – but the Alnwick strokemaker bounced back with strong wins over Michael Jenkins and Mark Richmond to finish 9th overall. Tynemouth’s Jamie Todd beat Northern’s Alex Robertson 3-1 in the first round – two natural athletes producing a competitive fast-paced game. Toddy was edged out 3-2 in the next round to Ben Turmel, but came back strongly to claim two very impressive scalps in Henry Beach and Harry Falconer to finish 5th. The win over Falconer was another 3-2 marathon effort, Jamie – who never likes to miss an opportunity to push his dad’s blood pressure up – waited until he was 10-7 down in the fifth, then paused, lit a cigar and came back to clinch it 12-10. Another player who likes to get his money’s worth on court is Cai Younger, who, as an unseeded player, knocked out three of the top dogs on his way to 5th in Boys U19s. Younger saw off 3/4 seed Nathan Kaiser for starters – lost to Connor Sheen in round two, then produced one of his best-ever results to see off England international Jack Cooper – ranked No 3 in the country at U17s – 3-2 in Round 3. If that was a lung-bursting effort, the Northern lad’s last match, against superfit No 2 seed Ollie Turner, arguably eclipsed it. The underdog led 1-0 and 2-1 in a million-miles-an-hour encounter, but at 9-3 down to Turner in the 5th, even Betfair closed the book. Younger, though, was not finished yet, and somehow battled back to clinch it 12-10 with the help of an emergency oxygen canister thrown down from the gallery. The U19s event was lit up by a cushty performance from Indian International Kush Kumar – here in England on a training stint with Malcolm Willstrop at Pontefract. Kumar’s deceptively languid style on court and killer shots brought him the trophy – having dropped only one game, to Jack Cooper, throughout. Jesmond’s Dan Wareing finished with a flourish – a 3-1 win over the livewire Adam Pritchard of Merseyside clinching 11th spot in a very strong field. Northern’s in-form Sam Broughton lost a hard-fought match against Yorkshire’s Daniel Bray (3-1) in his first round, but bounced back to finish 17th. Broughton beat Hill 3-0 in the ‘Sam derby’ next up, then saw off Tynemouth’s Matthew Carr and Northern clubmate Cameron Hamilton to take the Plate event.